Since Shaun is on this goal kick and one of his goals is health related, I'm playing along and making him a lunch, as long as it's the bloggable kind! Actually, since I don't buy a whole lot of disposable baggies and wraps, it pretty much has to be the bloggable kind, or he's going to be carrying his sandwich to work in his pocket. ;o) Thankfully, he's more than amenable to the idea and usually has a few good suggestions of his own. Since this is all part of his health goal, he has a lunch bento (above) and two separate snacks (not pictured, it wasn't exciting). For lunch, he has an egg salad wrap on whole grain tortilla, fresh from the Kroger bakery, on top of a bed of lettuce with a few onion, cucumber & tomato bits around it. I put salad dressing in a little container and my thought was he could make a very small salad once he took out the wrap. To the right, he has a homemade muffin that I *think* is assorted berries (see the Muffin Tin Monday post to see why I don't know) and a mixture of fresh fruits--honeydew, blackberries, strawberries and blueberries. It's packed in one of our EasyLunchboxes. For his morning snack/coffee break, he had zucchini bars and mixed berries; for an afternoon snack, he had the last of the corndog muffins and some cubes of cheese (extra protein before two marital arts classes tonight, teaching the kids and taking his own). I just wanted to say thank you, again. I don't mean to be all drama llama but my kids eat better because of you, ya know? No more infuriating school lunches for them. I have a small request: can you make a category/post tag for snacks? Stuff other than simple raw veggies and fruit, like sweet potato chips, a healthy pop corn recipe maybe, something to satisfy a salty craving? I'm not having very inspiring ideas. I love your lunch ideas! 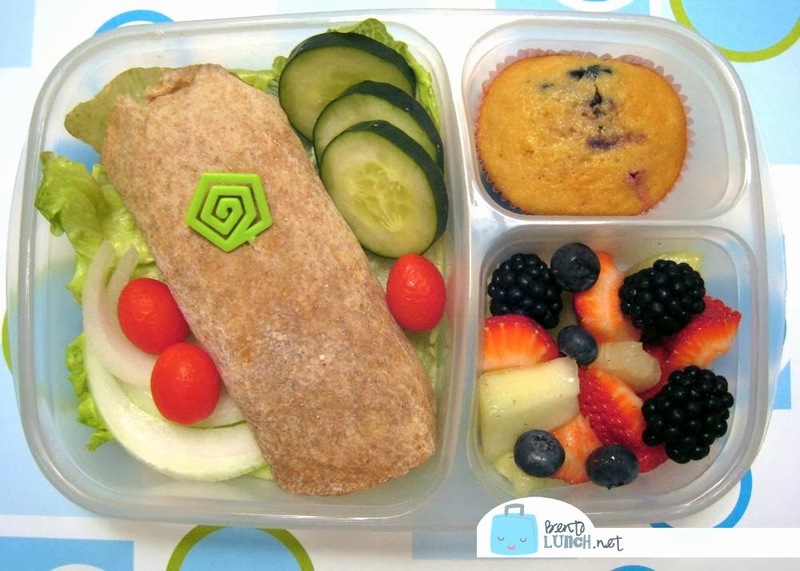 I just ordered a set of easy lunchboxes and I'm excited to try them out soon. It seems so much easier than all the little baggies of fruits, veggies and snacks!! Thanks for sharing! awesome! i found your blog at the beginning of the summer, bought all the bento stuff and finally tomorrow is the first day of school and i just made my very first Bento lunch for my 1st grader! Star shaped mini turkey Sandwiches, fish shaped watermelon, some grapes, yogurt, and some chocolate cat cookies! thanks for the inspiration! That is the perfect healthy meal! LOVE your site. Recommended it to my friends. Keep up the awesome work and know that even if you don't get active comments, we're watching and loving what you do!